Recently, it has been a bit cloudy and drab...so, in order to contrast these somber days, I've been using one of my favorite Fall handbags to inject a bit of color into my wardrobe. I purchased this hobo bag a few years ago at UrbanOutfitters.com, the brand is Sabina and I believe it was somewhere around $150. I LOVE this bag, the dark teal color is just GORGEOUS!!! The leather is thick yet soft...love how it feels in my hands. The pleated body gives this bag dimension and character. Tassels, tassels, tassels, I really have a thing for ANYTHING with tassels. I have no idea where this affinity came from but I just adore them. Tassels just give anything/everything added charm and uniqueness. Also, I love both the solid and braided leather straps along the side of the bag. Details such as this, are what I look for when shopping for a handbag. The braided handle feels very comfortable in my hands and I enjoy the fact that when I'm wearing it on my shoulders, the strap doesn't slide off. The lining is a beautiful dark teal satin material. 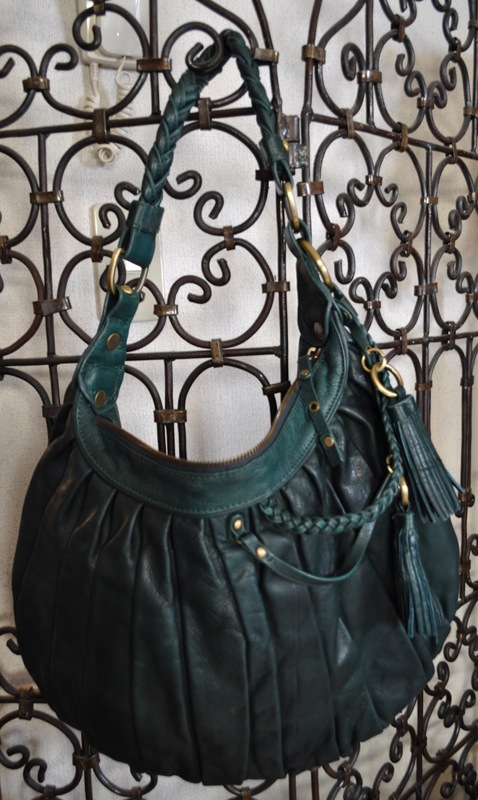 What handbag have you been loving this Fall?